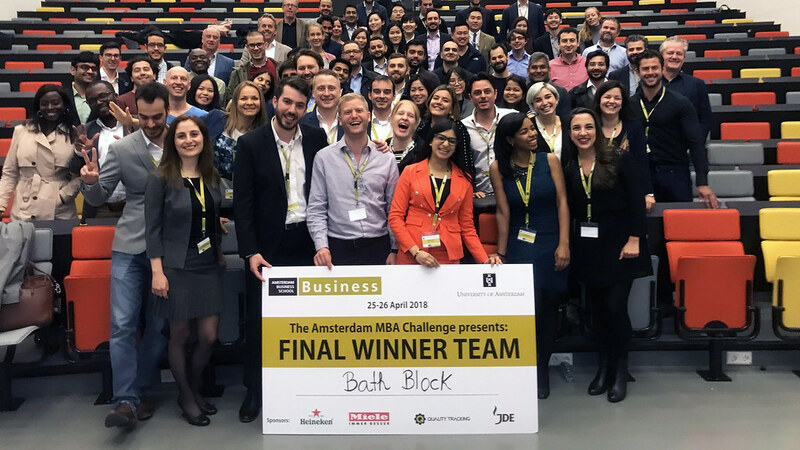 BathBlock beat 15 other teams of MBA students to win the Amsterdam MBA Case Challenge. Bath MBA students have won the Amsterdam MBA Challenge, beating students from top business schools across Europe. Ritika Israni, Philip Hodgson, Crissey Hewitt and Stamatis Foteinogiannopoulos made up team BathBlock, who worked on a Blockchain challenge with Heineken. The competition took place at the Amsterdam Business School over two days (25-26 April). The event included talks from industry experts and workshops. The teams involved also met representatives from the challenge sponsors to work on their business ideas. BathBlock’s task was to improve Heineken’s procurement process using Blockchain technology. During the first round they defeated three other teams of MBA students working on the same challenge. In the final they then took on the winning teams from three similar challenges. Their idea was selected as the winner of the competition by a panel of experts. As well as the Blockchain challenge posed by Heineken, there were challenges involving Big Data from Consorcio RedeMob, Artificial Intelligence from Jacobs Douwe Egberts and the Internet of Things from Miele. It was a very fulfilling feeling to be able to apply what we are learning in the MBA modules to real world problems. We are grateful to have personal attention and interaction with world class faculty members. This is due to the small class size that The Bath MBA continues to maintain. MBA students from the likes of ESADE, Rotterdam Business School and Alliance Manchester Business School also took part.